Perhaps the most basic observation about the universe is that the objects within it seem to influence each other's motion. And they do this without colliding or even touching each other. It is as if each exerts a force of attraction on every other ob­ject in the universe, the strength of which is inversely proportional to the square of the respective distance of each. The result is that all the objects in the universe are, in the long term, falling towards each other at an ever-increasing rate of accelera­tion. The observed magnitudes of the forces with which objects in the universe attract each other is much greater than that which would be cau­sed solely by the material in those objects. For this reason, scientists postulate a much larger quantity of unobservable material they call dark matter. 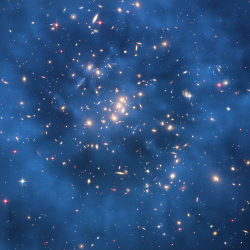 The image on the right shows the gal­axy cluster CL0024+17, in which the estimated associated dark matter, within and around the cluster, is shown as a blue haze. Dark matter is not the agency which causes objects to attract each other. It is merely additional mass, which behaves, gravitationally, in the same way as visible matter. Notwithstanding, as will be discussed in the essay on the Notion of Motion, none of these objects is experiencing either a directed external force or the inertial reaction from the resulting acceleration. Therefore the objects are not attracting each other. Consequently, their complex convoluted motions must have some other cause. To me, the most pragmatic hypothesis as to the cause of the observed motions of objects in space is that the presence of an object must somehow change the constituency of space within its vicinity. If the constituency of space can be changed then space must have some kind of substance or being. It cannot be just nothing. It is for this reason that many people have thought of so-called empty space as comprising some kind of fundamental fabric. The problem with this idea is that observation and experiment reveal that this fundamental fabric has no frame of reference. When I, as an observer, am mov­ing relative to an object which I am observing, the fabric always seems to be stationary relative to me. If the other object is also an observer who is observing me, then from his point of view, the fundamental fabric appears to be sta­tionary to him, not me. This fundamental fabric is very difficult to conceptualize and is certainly counter-intuitive to all human experience. The independence of different observers' frames of reference suggests that every observer in the universe has his own fundamental fabric, which extends throughout the entire universe in super-position with that of every other observer. Furthermore, everybody's fundamental fabric must be able to freely and frictionlessly permeate everybody else's, irrespective of relative motion between observers and what they observe. But who would qualify to have his own fundamental fabric that permeates the entire universe? And on what basis? Is a fundamental fabric only granted to observers, i.e. to conscious entities with physical senses? Or does every point in space have one, irrespective of whether or not it be a seat of consciousness or even contain material substance? This line of reasoning gets more and more implausible. When I try to imagine the nature of the strands of this fundamental fabric, I become overwhelmed by para­dox. Either its strands are infinitely malleable or they are able to twist, tangle and stretch ad infinitum. It begs for a simpler view to be sought concerning the nature of space. My vision becomes clearer if I consider the strands of the fundamental fabric not to have length but instead to have velocity-difference. Thus, the nature of the strands of the fundamental fabric is one differential with respect to time removed from that of a physical thread. It appears that, in the nature of space, velocity is a more basic concept than distance. It would therefore be more appropriate not to measure distance in metres and velocity in metres per second. Rather, we should measure velocity in knots, distance in knot-seconds and acceleration in knots per second, where, in this context, a knot is re-defined as what, in conventional units, would be a metre per second. In this view, the paradox of the fabric being stationary from every object's point of view disappears. Stationariness is merely a special case of relative velocity: i.e. when relative velocity is zero. And the only situation in which an object "moves", with respect to the fabric, is when it is in a state of forced acceleration. Thus the fabric of space unimpedingly accommodates any freely moving object; that is, any object not being acted upon by an external force. Imagine a universe in which the fabric of space - the æther - is homogeneously dist­ributed. This could be a universe in which space continues infinitely in any direction. It could be a universe in which space is somehow looped or manifolded. It does not really matter. What matters is that the fabric of space - the æther - is uniformly distributed throughout that space. This means that the æther itself is not moving. It is not flowing in any direction. Nor is it dispersing or concentrating in any region of space. Let us suppose that this universe contains hypothetical objects which do not attract or in any way interfere with each other. If, in such a universe, the Finger of God were to exert an external monoforce on such an object, the æther would, through the substance of the object, counter that force with an equal and opposite inertial reaction. Against any unperturbed frame of reference; that is, a frame of reference moving at constant velocity, the object would be seen to be undergoing active acceleration. 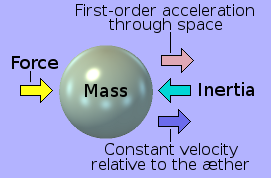 The magnitude of that acceleration, a, is humanly perceived to be proportional to the magnitude of the applied force, F. In other words, a = k × F. By mainstream convention, the constant of proportionality is stated as M, where M = 1 ÷ k, which is known as the mass of the object being accelerated. Notwithstanding, human per­ception is fallible. Consequently, we do not know whether or not this so-called pro­portionality becomes highly non-linear under extreme magnitudes of force. All we can safely assert is that the rate at which the object accelerates is a function of the magnitude of the force and the mass of the object. In other words, a = f(F,M), where f is a particular but unknown algebraic function. It would appear, however, that the universe could never remain in such a perfectly symmetrical state of æthereal homogeneity. This is because, under the prevailing laws of physics, this is not a stable state for the universe. It is, what is termed, a meta-stable state. It is like a tetrahedron (a triangular pyramid) balanced precisely on one of its points. The very slightest push in any direction will send it falling ever faster until it lands flat on one of its triangular faces. And that slightest push, in the case of the universe, is when the otherwise homogeneous æther becomes - for whatever reason - ever so slightly concentrated in any particular place or places. Notwithstanding, a universe made solely of homogeneous æther - a universe con­taining no material objects whatsoever - may actually be stable. For the universe to become meta-stable, in the first place, requires a catalyst. This catalyst is, some­thing I imagine conceptually as, a knot in the fabric of space. It is a knot in the æther. However, such a knot cannot tie itself. It can only be tied by some kind of external active agency. Perhaps a knot isn't really the best analogy. I imagine the real mechanism as being more in the nature of a push-and-latch button-operated switch, as used to switch an electrical device on or off. To switch the device on, finger pressure is applied to the button. This pushes the button inwards against the force of an internal loading spring. When the button is fully in, it latches mechanically, keeping the device on when finger pressure is removed. To switch off the device, finger pressure is applied to the depressed button, pushing it in slightly. This releases the latch, allowing the spring to push the button outwards back to the off position. My best effort at explaining my perception of this process is as follows. If, by some means, the æther becomes super-compressed within a very small region of space, it somehow gets turned inside out. Furthermore, if its compression exceeds a cer­tain threshold, the æther becomes self-latched into its inside-out state of being. In its basic form, the volume of space containing this inside-out æther is what science perceives as a stable subatomic particle of matter. This process has a profound collateral effect. It alters the whole geometry of space. A universe composed of homogeneous æther, which contains no material objects, is spatially symmetrical. A universe containing little spheroids of inside-out æther is spatially asymmetrical. Each spheroid crimps the otherwise homogeneous æther around it into a spherical hinterland within which the æther becomes increasingly concentrated towards the centre. Consider a universe in which there is only one microscopic spheroid of inside-out æther. The æther in this universe, instead of being homogeneous, is spherically het­erogeneous. Its concentration or density is maximum at the surface of inversion; that is, at the surface of the spheroid within which the æther has been turned inside-out. From here, its concentration decreases radially from the spheroid until it reaches its minimum - or ambient value of - concentration at infinity. Thus, the æther has a constant concentration over the full extent of any spherical surface which is centred on the microscopic spheroid of inside-out æther. The mag­nitude of æthereal concentration decreases as the radius of the spherical surface increases and, conversely, increases as the radius of the spherical surface decr­eases. More specifically, the æthereal concentration is inversely proportional to the square of the radius of the spherical surface. Another - more linear - way of ex­pressing this is to say that the æthereal density is inversely proportional to the area of the spherical surface. r = radius of a spherical surface centred on the spheroid. A = area of the spherical surface = 4πr². ρ = concentration of the æther at the spherical surface. Ais = area of the inversion surface of spheroid = 4πris². ρis = concentration of æther at inversion surface of spheroid. ρamb = ambient concentration of æther infinitely far from the spheroid. k = a constant of proportionality. Thus, the concentration or density of the æther, at any arbitrary spherical surface of area, A, is given by: ρ = ρamb + k ÷ A. The maximum concentration of normal (non-inside-out) æther occurs at the inversion surface of the tiny spheroid. This is given by: ρis = ρamb + k ÷ Ais. Note that Ais is extremely small, making ρis extremely large. Ais cannot be zero, otherwise the æthereal density, ρis, would be infinite at a point singularity at the centre of the spheroid. Observation shows that nature does not like singularities. For example, in Newton's Law of Gravitation, F = G × M1 × M2 ÷ r², his so-called force of gravity, F, would become infinite as the masses coalesced. This does not happen because the masses M1 and M2 occupy (are distributed over) finite volumes of space. The universe I have just described, with its single microscopic spheroid of inverted (or inside-out) æther, is not symmetrical. It is asymmetrical. This is because its contours of equal æther-density are spherical surfaces. And, contrary to most people's apparent intuition, a sphere is not a symmetrical form. This is because, although it is radially symmetrical in all directions in space, its inside is not sym­metrical with its outside. The outside of a spherical surface is not the same as its inside. Inside a spherical surface is a relatively small finite volume of space, within which one can travel in a straight line for only a relatively short finite distance. The outside of a spherical surface contains infinite space, within which one can travel in a straight line forever. In nature, asymmetry is conceptually synonymous with imbalance, which, in turn, leads to instability. A spherically asymmetrical universe must therefore be unstable - or, at least, only meta-stable. It must thus be in a permanent state of fall, which is a permanent state of change. The best way I have been able to conceptualise such a universe is to imagine the æther as a fluid, which is flowing radially, from infinity in every direction, into the microscopic spheroid. In other words, it is as if the spheroid of inside-out æther were a sink hole through which the æther of the universe were continually emptying. Of course, this is simply a perceptual aid of mine. The æther may not be flowing at all. Nonetheless, the idea does help me gain a cogent vision of how the universe seems to be working. I visualise the universe that I have described as one in which a fluid æther is in a continual state of fall (or flow), from infinity, into a single microscopic spheroidal sink hole. On the right, the animation depicts the progression of an arbitrary spherical shell of æther as it falls (or collapses) from infinity into the sink-hole, which is shown as a small black spheroid at the cen­tre. The radius of the spherical surface collap­ses at a constant rate. This causes the area of the spherical surface to shrink at an ever in­creasing rate. It also necessarily causes the flux density (or concentration) of the æther to increase at an ever increasing rate. r = radius of the arbitrary spherical surface. r' = rate at which r is decreasing with time. = −dr/dt, which I speculate to be constant, −c †. A' = the rate at which A is decreasing. † Note: c is preceded by a minus sign because it is a rate of radial decrease. Note also that c here does not (necessarily) signify the velocity of light. As the spherical surface collapses at constant velocity, c, its area collapses at a rate Cr, which diminishes as the radius, r, diminishes. In other words, the rate of change of area depends on the current instantaneous radius of the collapsing sphere. which is inversely proportional to the surface area A. Thus, the density, ρ, of the æther, at any given radial distance, r, from the spheroid, is proportional to the inverse square of that radial distance. I have depicted the radial collapse as taking place at a smooth constant radial velocity, 'c'. Notwithstanding, although constant, it may not be perfectly smooth. The inward radial flow of the æther could be, to some degree, fitful. That is, it could be moving in regular fits and starts. Its radial motion could have a kind of longitudinal resonance. There is little observational basis for this idea except that various aspects of Quan­tum Mechanical theory allude to the idea that space-time may, at a scale fundamentally beyond investigation, have some degree of granularity. The size of the fundamental granule is what they call the Planck Length ℓp. The corresponding granule of time is the Planck Time tp. The idea that æther flows fitfully in longitudinal waves, throughout its journey to a sink hole from the infinite reaches of space-time, does not appeal to me. On the other hand, the existence of discrete objects does evince some fundamental gen­erator of granularity. My vision of the æther is that it is a velocity-fluid. This means that it can exist only while converging at radial velocity 'c'. If it stops, it ceases to exist. Consequently, my preferred speculation is that æther requires a finite amount of time tp to decelerate from its velocity of radial convergence, 'c', to zero and disappear into a sink hole and thereby cease to exist. On this basis, if the radius, r, of a sink hole be ℓp, where ℓp = c × tp, then the æther will flow smoothly into the sink hole. However, if, by the decree of some as yet un­known fundamental constant, r ≠ ℓp, then standing waves of æther will be set up immediately around the sink hole. Perhaps the size of a sink hole is a universal con­stant. Perhaps they come in two sizes, one with r < ℓp and one with r > ℓp. 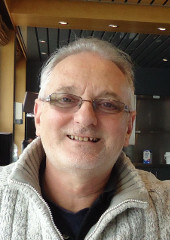 One could reflect positive standing waves and the other negative ones, thus creating the fun­damental mechanism whereby particles are constructed. The Planck Length ℓp = 1·6 × 10-35 metre. The Planck Time tp = 5·39 × 10-44 second. The mean frequency of the resulting standing waves would therefore be a bit either side of 1·855 × 1043 hertz. That is 1·855 × 1031 terahertz. It is a frequency way be­yond detectability or measurability. Perhaps it is nature's fuzzy upper limit of frequ­ency, to which all derivative standing wave structures like atoms and molecules owe their existences. However, since such resonances are fundamentally beyond human observation, I shall continue on the basis that the æther collapses into sink holes with a uniform flow. In the universe described above, the æther would simply flow, at velocity c, radially into its single tiny spheroidal sink-hole. But the flow of the æther would not cause any objects to fall towards the sink-hole because there aren't any other objects in this universe. So I will now consider a universe with two sink-holes reasonably close to each other. Consider a universe containing only two sink-holes separated by a distance, d. At a very large radius, the surface of constant flux-density is practically spherical, with the centre of the sphere mid-way between the two sink-holes. As the radial distance is reduced, the surface of constant flux-density becomes ever more ellipsoidal, with one sink-hole at each focal point of the ellipsoid. 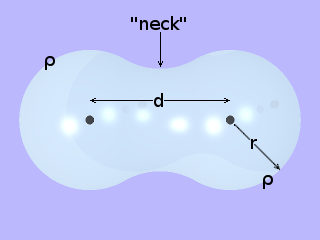 As the radius of the surface of constant flux density decreases below d, the ellipsoid begins to "neck" in the middle, like a steel rod that is stressed beyond its strain threshold. The adjacent diagram provides an im­pression of the approximate shape of the surface of constant æthereal flux density at which the radial distance r is equal to half the distance between the two sink-holes, viz: r = ½d. As the rad­ius of the surface reduces further, the "neck" narrows until the surface finally splits to enclose two separate volumes of space. These two separate surfaces, however, are not spherical. They are the shape of squashed eggs with their bottoms facing each other. Apologies, but at the time of writing, I did not have the time or the patience to cre­ate an animation of the collapse of a surface of constant æthereal flux density in a universe containing two sink-holes. Notwithstanding, the collapsing surface passes sequentially between the shapes stated above, with each successive shape gradual­ly morphing into the next. In a universe containing only one sink-hole, the æthereal flow cannot be anything other than radially symmetrical. In a two-sink-hole universe, however, the flow of the æther does not have perfect radial symmetry. And it seems that there is a law, operating within the universe, which regards any degree of radial asymmetry as an error which must be corrected. To correct this radial asymmetry, the two separate sink-holes must be brought together. The distance, d, must be reduced to zero. So it is the radial asymmetry in the flow of the æther into the sink-holes which causes them to accelerate towards each other rather than any mysterious or fictitious force of attraction acting between them. Another possible way of looking at this law of minimizing radial asymmetry is to say that the universe always strives to maximize the volume of æther contained within a given surface area. And the only way to do this is to make the volume spherical, which is synonymous with making it radially symmetrical. It is as if a surface of constant æthereal density is like the surface of a soap bubble. The surface tension within the soapy surface always strives to enclose the air it contains using a minimum surface area, which is spherical, and therefore, radially symmetrical. Perhaps a loose analogy of the principle would be a two-dimensional vortex such as can occur where the fresh water of a river meets the salt water of the sea or above the plug-hole of a bath or washbasin as it is emptying. 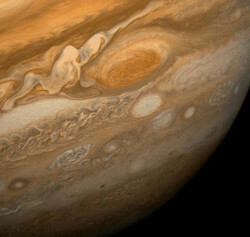 Another analogy would be the atmospheric vortices which occur in the atmospheres of gas-giant planets like Jupiter, as shown on the right. Such vortices attract each other, orbit each other, and sometimes coalesce. However, gas-giants' atmospheric vortices are generally pumped by external energy sources, which tends to make them last indefinitely. Each of the two sink-holes, in my two-sink-hole universe, is surrounded by its res­pective 3-dimensional vortex of æther, which is flowing radially into it. Each is thus surrounded by its own radially-symmetrical in-flow of æther. Each is thus - of itself - in balanced equilibrium with the universe. However, it is also immersed within the symmetrical radial in-flow of its neighbour, which, from its point of view, is not radially symmetrical. In the diagram on the left, the two sink-holes, S1 and S2 are separated by a distance, r, in an otherwise empty universe. 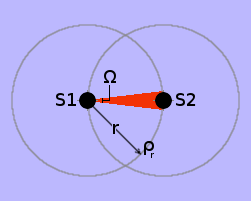 By consequence, S2 is immersed in the convergent æthereal in-flow of S1, which has the form of a solid cone shown in red. Suppose the solid angle of the cone is Ω steradians. Then the area, AS2, of the spherical surface subtended by S2 must be Ωr² square metres. Thus AS2 = Ωr². 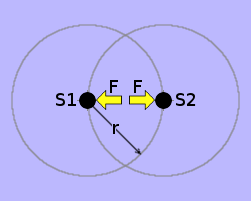 Suppose also that the flux-density of S1's æthereal in-flow at radius, r, where S2 is located, is ρr. Suppose the area of the spherical surface surrounding S1, at a radial distance of r from S1, be Ar. Thus, Ar = 4πr². Suppose further that the total amount of æthereal flux flowing into a sink-hole be H0. This is assumed to be the same for all sink-holes because all sink-holes are deemed to be identical. Since all sink-holes are identical, let us assume that the cross-sectional area of a sink-hole be always A0. By consequ­ence AS2 = A0 is a universal invariant. Thus the radial flow of æther into S1 causes S2 to accelerate towards S1 at a rate that is inversely proportional to the square of the distance, r, between S1 and S2. Conversely, the radial flow of æther into S2 causes S1 to accelerate towards S2 at a rate that is inversely proportional to the square of the distance, r, between S2 and S1. Consequently, the two sink-holes will accelerate towards the point in space mid-way between them at Ξ ÷ r² metres per second per second. They will therefore appear to be accelerating towards each other at twice this rate. Of course, the instant the radius decreases slightly, the induced rate of acceleration will increase. Thus the long-term acceleration of the sink-holes towards each other is highly non-linear. Note that, in the formula Fr = Γ ÷ r², r can never become zero making Fr infinite. This is because the inversion radius, r0, of the sink hole is always, by decree of nat­ure, a universally standard finite size such that A0 = π × (r0)². Unlike the single-sink-hole universe, as des­cribed above, my vision of the real uni­verse, which I shall describe more fully in the essay Objects and Observers, contains an inexpressibly large number of sink-holes. Intuitively, I imagine this universe as a vast sphere of æther, as shown on the left, with all its sink-holes - which constitute all the so-called matter in the universe - concentr­ated in a relatively small volume of space at its centre. The flow of the æther into each sink-hole would thus be ostensibly spherical (i.e. radially symmetrical), with slight radial asymmetry imposed by the flow of the æther into its neighbouring sink-holes. According to my hypothesis, the æther pours continually - at an ostensibly constant radial velocity, c - into all of these sink-holes. The spherical flow of the æther into each sink-hole causes the sink-holes to accelerate towards each other. If uncheck­ed, they would fall into ever closer orbits around each other until they all eventually coalesced into a single gigantic sink-hole. It would seem, however, that something prevents sink-holes from coalescing, thus facilitating the formation of sub-atomic, atomic and molecular structures and hence planets, solar systems and galaxies. Suppose I am standing on the Earth at a nominal radial dis­tance of rE = 6371 kilometres from its centre. At this radius, the ground exerts a real force, namely, my weight, Fw = 804 newtons, on the bottoms of my feet. But I am not accelerating relative to the Earth. Nor, for that matter, am I accelerating relative to any other object in the universe. 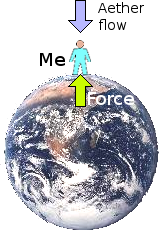 The force, Fw, is a result of the æther flowing through my body at constant radial velocity, c, into the Earth, as given by the formula Fw = Γ ÷ rE². Hence, a real force is being applied to the bottoms of my feet, by the ground, to counter the inertial force induced, within the material of my body, by the constant-velocity flow of the æther through it into the Earth. If I were standing on the Moon instead of the Earth, my body would still have the same mass of 82 kilograms. However, the force of my weight - the upward force, which the surface of the Moon would be exerting on the bottoms of my feet, would not be 804 newtons. It would be only just over 133 newtons. This is because, on the surface of the Moon, although the æther is passing through my body at the same downward velocity, c, its flux density, ρ, is only 133 ÷ 804 = 0·165422886 of its value at the Earth's surface. I imagine the æthereal flux density, ρ, to be analogous to the degree of coupling - or bite - between the plates of a friction clutch, like in the stick-shift type trans­mission of a car. As ρ increases, so, proportionally, does the amount of downward inertial force it induces into an object resting on the surface of the Earth. As the reactive force from the surface of the Earth (weight) is proportional to æthereal flux density, so it is also in the case of the reactive inertia to force-induced acceleration in free space. 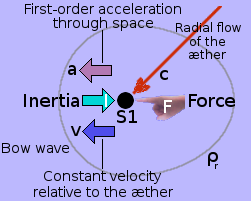 The acceleration, caused by an applied external force acting upon an object, must cause that object to distort the radial symmetry of the flow of the æther into the object. Let us go back to the single sink-hole universe and suppose that the Finger of God applies a monoforce, F, to the sink-hole as shown on the left. This causes the sink-hole to accelerate through space, which, in turn, causes the flow of the æther into the sink-hole to become radially asymmetrical, as depicted by the egg shaped flux-density contour shown in grey. The Universal Law of Symmetry acts to correct this asymmetry by exerting an inertial reaction, I, equal and in opposition to the force F.
Thus, when a sink-hole is forcibly accelerated through space, the Universal Law of Symmetry acts like a negative feed-back mechanism, whose task it is to bring the flow of the æther back into a state of radial symmetry. It is now necessary to make a clear distinction between two things, which at first sight may seem to be the same but which are not. These are: velocity and rate of convergence. The flow of the æther converges, from all directions in 3-dimensional space, into the sink-hole at a specific rate of convergence, c, increasing its concen­tration (or flux-density) as it goes. Thus, its flow is radially symmetrical. A sink-hole, on the other hand, being an integral object, cannot move in a radially symmetrical manner. At any given instant, it can only be moving linearly through the æther in one single direction, that is, along one single radius. So its motion is not radially symmetrical with respect to the universe. Remember that the æther is a velocity-fluid. It only manifests its presence to the sink-hole when the sink-hole accelerates. Consequently, while the sink-hole moves at any constant velocity through space relative to any arbitrary frame of reference, the æther always flows into it, at velocity c, with perfect radial symmetry. However, when acted upon by the monoforce, F, exerted by the Finger of God, the sink-hole undergoes an acceleration, a, through space, while moving at constant velocity, v, through the æther. Now let us return to the macroscopic (multi-sink-hole) universe of objects, planets, stars and galaxies. Here, any macroscopic object, such as a ball or a planet, is simply a composite structure made up of an astronomical number of sink-holes. Consequently, while such an object is at rest with respect to the æther - when it is in free empty space or in orbit with and around other objects - it moves, as would a single sink-hole, relative to all other objects without the involvement of any ext­ernally-applied force. The object moves through (relative to) the æther only when being acted upon by an externally-applied force. Thus, when a constant active force - such as that produced by a rocket - is applied to an object in free space, far from the sight or in­fluence of any other objects, the constant force causes the object to undergo a first order acceleration through space. This is the same as the object moving at constant velo­city, v, through the æther. Forced motion through the æther generates an equal and opposite inertial reaction. The reason for this, according to my hypothesis, is that acceleration through space (uniform motion through the æther) causes the radial flow of the æther into the object to become radially asymmetrical. In response, the Universal Law of Sym­metry imposes an equal inertial reaction against the external force. It is as if, when the radial symmetry of the æthereal flow becomes distorted, it acts like stretched elastic, forcing itself back into its preferred state of radial symmetry. where a real external force applied to a point on the surface of an object in free space causes it to accelerate. In both cases, a force of constant magnitude is synonymous with motion through the æther at constant velocity, v. But are these two situations really equivalent? One may be very tempted to say that they are exactly equivalent. Notwithstanding, there are two very significant differences between these two situations. The first is as follows. The force accelerating an object in free space (such as that provided by a rocket) is temporary. It can only be maintained by the continual sup­ply and dissipation of energy. On the other hand, the force exerted by the ground, on the bottoms of my feet, is permanent and does not dissipate energy. A rocket motor applies an external proactive force at a specific point on the surface of the sphere. This causes the sphere to accelerate - in an absolute or universal sense - through free space. This is equivalent to the sphere moving through the æther at a con­stant velocity, which perturbs the æthereal flux, into the sphere, from its normal state of radial symmetry. The Universal Law of Symmetry acts to restore the radial symmetry of the flow of the æther into the sphere by generating an equal and opposite reactive inertia. The reactive force of weight, exerted by the ground, is passive. It does not consume or dissipate energy. The applied proactive force requires the spontaneous or deliberate directed release of stored energy. All the foregoing demonstrates that the linkage between force, object, inertia and æthereal flux is bidirectional. In other words, through (or across) this linkage, cause and effect are interchangeable. In this sense, they are equivalent. Notwithstanding, in that the first case does not involve energy, while the second case does, means that the two cases are not strictly equivalent. There is also another aspect in which these two situations are not strictly equivalent. The flow of the æther into a sink-hole is convergent. The æther flows inwards, from all directions in three-dimensional space. The flow is radially-symmetrical. Planet Earth comprises an astronomical number of æthereal sink-holes. The æther there­fore flows into the Earth from all directions in three-dimensional space. The flow is radially-symmetrical. It is convergent. By consequence, as will be described in more detail in the essay on Force and Inertia, the reactive force, exerted by the Earth's surface, at its point of contact with an object resting upon it, is divergent. It seems, therefore, that a divergent force, because it is radially symmetrical (i.e. potentially pushing equally in all directions), cannot move its point of application. It therefore cannot do work. It cannot dissipate energy. If it could, it would be unilaterally able to violate the Universal Law of Symmetry. The flow of æther into a sink-hole, and the consequential reactive force produced by it, is the rest-state of the universe. It is a dynamic state in which I imagine the flow of the æther as analogous to the flow of an electric current within a super-conductor. Nothing drives it. Nothing needs to drive it. That's just the way it is. On the other hand, a directed external force, exerted on a sink-hole by the Finger of God, is not radially-symmetrical. Thus it is not divergent but linear. It acts along a single straight path. It is therefore as radially-asymmetrical as it is possible to be. This causes the sink-hole to accelerate through space, and hence, to move uni­formly through the æther. Uniform motion through the æther distorts the radial symmetry of the æthereal flux into the sink-hole. The Universal Law of Symmetry acts to correct this radial asymmetry by exerting an inertial reaction, equal and opposite to the applied force. I use the Finger of God to signify an imaginary agency, which exists outside the universe, but whose action can be felt within it. A directed force, exerted by the Finger of God upon a single sink-hole, thus influences the universe. It acts from out­side the universe, to change, to whatever small extent, the universe's internal dynamic state. This implies that, in this case, the change in the dynamic state of the universe requires a deliberate (wilful) Act of God. A macroscopic object, such as a ball or a planet, is simply a composite structure made up of an astronomical number of sink-holes. Consequently, if the Finger of God applies a force to an object in space, the situation, in principle, is the same as for a single sink-hole. Events such as explosions or directed jets of material can occur naturally when the release of stored energy is spontaneously triggered by some means. However, unlike the force exerted by the Finger of God, the forces resulting from these events are random in both direction and magnitude. Such events do change the dynamic state of the universe. However, they are essentially the reverse of events that originally captured and stored the energy that is released by them. Thus, in the long term, the state of the universe has not changed. It has simply reverted, in part perhaps, to a state it had sometime in the past. On the other hand, the exertion of a physical force by a sentient being, such as man, can be wilfully directed. It can therefore influence the physical universe in a premeditated or designed way. Force, exerted by the hand of man, can accelerate different objects in whatever desired directions. It facilitates the realization of the will of man in physical form. It allows the will of man to create order out of chaos: to create mechanism and information. Forces, exerted by the hands of men, can thereby facilitate the communication of thoughts between conscious beings. I think, therefore I am. I am conscious, therefore I am aware. But awareness, by its very nature, requires that I be aware of something. Without an object of awareness, I could not be aware. I would have nothing about which to think, therefore I could not think. If I could not think, I would not be. But I do think, therefore I am. So, about what do I think? Of what am I aware? The object of my awareness is the vis­ible universe and all it contains. However, at the most fundamental level, I have no proactive power, within myself, to make myself aware of this universe. Consequently, it must be the universe itself that actively makes me aware of it. But how does it do this? By what means? My awareness, of the universe outside of me, seems to comprise a continual flow of information converging upon me from every direction in three-dimensional space. Sights, sounds, smells, textures and tastes arrive at my bodily senses and are con­veyed to my conscious self via my brain. Sounds, smells, textures and tastes all arrive from relatively close quarters within my immediate terrestrial environment. Sights, on the other hand, can arrive from anywhere - from right before my eyes, out to the furthest reaches of the cosmos. This leads me to suppose that sights must be conveyed to me by something that is far more fundamental than those which convey the other agencies of my aware­ness. So, to discover how the universe is able to make me aware of itself, it would seem sensible to begin by investigating the nature and behaviour of this something. All the sights, which I see continually converging upon my consciousness, are, in essence, information. My inclination is to suppose that this information is somehow borne upon - or etched into - some kind of carrier or medium, which transports it to me from afar. I propose that this carrier or medium be the æther that I have de­scribed in this essay and that this be the very same æther that I described as the conveyor belt of time in the essay on Time and Space. This æther is the essence of which the whole universe is composed. It continually flows into sink-holes. The material, of which the retinas of my eyes are made, com­prises an astronomical number of sink-holes, into which æther is continually flowing. My eyes are somehow able to extract - or demodulate - information from the æther, as it arrives, and pass it on, via my brain, into my mind, for display within the window of my consciousness. When, on a clear tropical night, I stare upwards at Orion, my eyes always seem to gravitate towards the giant red star Betelgeuse at one of Orion's extreme corners. It is a star of immense size, which would encompass our Sun's inner planets. But I only see Betelgeuse as a small silvery-red speck. Thus Betelgeuse occupies only a minute solid angle of the total celestial sphere from which æther, from the most distant reaches of the cosmos, flows into the sink-holes of my retinas. However, as it passes by (or even through) Betelgeuse, the giant red star somehow etches its luminous signature upon this passing æther, analogous to the way the pen of a chart recorder etches its trace onto moving paper. The conventional scientific view is that the light from Betelgeuse radiates outwards as diverging spherical waves. But human observers cannot confirm, by direct ex­perience or measurement, the existence of such waves. They can only deduce their existence by thought. There is, however, an inverse view: that light is etched (or modulated) onto a passing æther, which is converging into the sink-holes of my retinas. This view is equally cogent geometrically and maps the direct experience of an observer. It is also consistent with my alternative concept of what mainstream science calls gravity. The geometry of this inverse view is illustrated below. Suppose I am an observer here on Planet Earth. As such, my eyes are located at the position eye2 in the above diagram, 642½ light years from Betelgeuse. At this distance, within my sphere of vision, the circular cross-sectional area of Betelgeuse subtends only a very small solid angle, ω2. The flux density, ρ2, of the æthereal in-flow, within the circular cross-sectional area of Betelgeuse, to a sink-hole within the retina of one of my eyes, is therefore very small. Consequently, Betelgeuse can etch only a very low-density light-signature onto my passing æthereal flux. The total energy, which the sink-hole's æthereal in-flow is able to draw in, must be very low, yielding only a small faint image of Betelgeuse. Now suppose I am an observer on a planet located at only half that distance from Betelgeuse. As such, my eyes are located at the position eye1 in the above diagram, 321¼ light years from Betelgeuse. At this distance, within my sphere of vision, the circular cross-sectional area of Betelgeuse subtends a solid angle, ω1, which is 4 times the size of ω2. The flux density, ρ1, of the æthereal in-flow, within the circular cross-sectional area of Betelgeuse, to a sink-hole within the retina of one of my eyes, is therefore 4 times ρ2. Consequently, Betelgeuse can etch a light-signature onto my passing æthereal flux at 4 times the energy-density. The total energy, which the sink-hole's æthereal in-flow is able to draw in, must therefore be 4 times that received on Earth, thus yielding a larger brighter image of Betelgeuse. The essence of this inverse view is that, somehow, the material of the star is able to write (etch or modulate information) upon the passing æther. That passing æther is being drawn in by an incomprehensible number of sink-holes all over the universe. This gives the impression of light radiating from the star. Notwithstanding, as an observer, I see nothing diverging from the star. I cannot see light-waves in transit. All that I see is what arrives at my eyes. And what appears to be happening is that light-borne information arrives at my eyes convergently from any direction in space. This is the simplest view. So, applying the principle of Ockham's Razor, which states that the simplest view is most likely to be the correct one, this is most probably the correct view of what is really happening. Please note that Betelgeuse cannot write its luminiferous signature onto the æther flowing into its own sink-holes. It may do. But if it does, the luminiferous signature thus written will disappear into Betelgeuse's own sink-holes with the æther that is carrying it. Thus, only the luminiferous signature that Betelgeuse writes onto passing æther (i.e. æther that is flowing radially-asymmetrically relative to Betelgeuse) is able to carry its luminiferous signature to observers within the universe. I conclude, therefore, that the conduit (or transport medium), which brings to me all information I receive about the universe around me, and which thereby imparts to me my sensation of passing time, is the æther I have described. I will discuss how I think stars write their luminiferous signatures onto the passing æther in a sub­sequent essay. My hypothesis is therefore that the universe comprises a fundamental fluid, which I have called the æther, flowing smoothly and continually into an incomprehensible number of tiny sink-holes. The æther in the universe is thus gradually emptying into the sink-holes. Consequently, if the overall density, ρ, of the æther in the universe remains con­stant then the universe must be contracting at a specific rate, s', in order to maintain that constant overall density. If, on the other hand, the size, s, of the universe be constant then the overall density, ρ, of the æther must be decreasing at a specific rate, ρ'. However, s and ρ may both be changing, thus opening the possibility that the universe could be expanding. Notwithstanding, an observer within the universe, who depends entirely upon the flow of the æther to bring to him information about the universe, will necessarily be unaware of any of this. Of course, the æther may not be flowing at all. What, with my limited Earth-bound experience, I perceive to be caused by æthereal-flow, may, in reality, be simply the result of perturbations within the two symmetries of a static æther, as follows. The magnitude of the apparent (or fictitious) force of attraction between two sink-holes may be proportional to the degree of radial asymmetry in the density of the æther in the vicinity of a sink hole. In other words, the density gradient of the æther is not the same in all directions in 3-dimensional space. 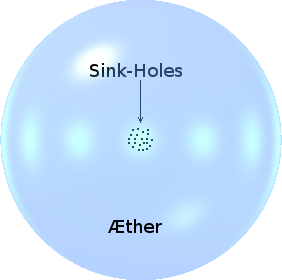 The convergence of a light-signature towards an observer, on the other hand, may be caused by the spherical asymmetry of the æther in the vicinity of a sink-hole. In other words, within any hypo­thetical spherical surface, centred on the sink-hole, the density of the æther inside the surface is not symmetrical with the density of the æther outside the surface. Thus, the resulting density gradient caus­es information to flow in the direction of increasing æthereal density. Notwithstanding, I shall continue to use my notion of the æther as a flowing fluid be­cause this is much easier for me, as a being whose experiences and notions were forged within the terrestrial biosphere, to visualize.